FXX Fall 2014 Schedule with Raising Hope, In Living Color; ION Revives Saving Hope in U.S.
FXX of course has added The Simpsons to its line-up after the historic 12-day day marathon, but they have more to come this Fall! The Simpsons is airing in a block format, Mondays 6pm-12am, Tuesdays 8pm-12am, Thursdays 8pm-12am, Fridays 6pm-12am and Sundays 4-8pm. We mentioned that Raising Hope would join the schedule this fall, but we now know the launch date and times. The comedy will premiere on Monday, Sept. 22. It will essentially replace Arrested Development on the schedule, as that series is no where to be found out after Sept. 22. Also leaving the schedule as of October 1 will be The Hughleys, replaced by the return of Sports Night. As for Raising Hope, it will air Mondays 2pm-6pm, Tues-Thurs around 11:30am-1pm, Fridays 2-6pm and Saturdays around 8:30am-10:30am. Check listings for exact timings on a given week. In addition to Sports Night, FXX will continue to air Mad About You and Parks & Recreation in the daytime. And finally, also joining the schedule this fall starting October 1 will be In Living Color to shake-up late nights. The sketch comedy will air usually Mon, Tues, Thurs and Fri in late night between 12-2am. Keep it right here for continued updates! ION Television today announced its latest partnership with leading independent studio Entertainment One Television (eOne), reaching an agreement for new original episodes of Saving Hope. Produced by eOne and ICF Films in association with CTV, season three of the medical drama series recently began production on 18 new episodes in June. The deal, which includes rights to existing seasons one and two, makes ION the exclusive original U.S. television network for current and future seasons of the series. 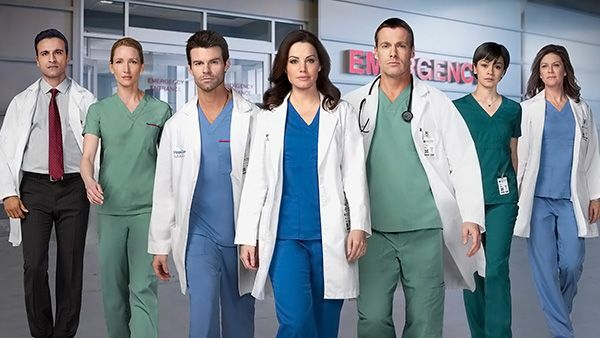 In Saving Hope, the Hope Zion Hospital is left in chaos when its charismatic Chief of Surgery, Charlie Harris (Michael Shanks), falls into a coma, putting his fiancé and fellow surgeon, Alex Reid (Erica Durance), in a state of shock. Along with newly arrived star surgeon, Joel Goran (Daniel Gillies), Reid races to save Harris' life. As the action unfolds, the comatose Harris explores the hospital halls in the form of a spirit, questioning whether or not he is a figment of his own imagination. Reid, along with her fellow doctors, press on to save his life and the lives of others as they deal with the complicated and courageous decisions that are made in their daily struggle to keep hope alive. The series also stars Huse Madhavji, Julia Taylor Ross and Kristopher Turner.